Audi's CES 2014 press conference opened with an energetic introductory video that emphasized the car maker's commitment to "turning science fiction into science fact." But one of the biggest announcements was the introduction of the mobile Audi Smart Display, a 10.2-inch Android-powered tablet that interfaces directly and seamlessly with Audi vehicles made possible through the company's partnership with Google and the Open Automotive Alliance announced at CES. "It is not just another tablet which you can put in the car, even if it looks that way," Audi Head of Electric and Electronics Development Ricky Hudi said during the press conference. "It represents the perfect combination of the latest technology from the world of consumer goods with the stuurdiness and reliability form the world of cars." 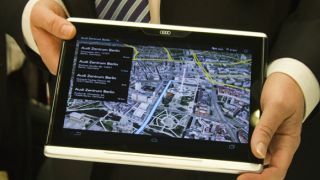 The tablet is powered by Nvidia's Tegra 40 chip and connects to the vehicle's Wi-Fi. It interfaces directly with the car's radio and other media functions, and also offers web browsing and other functions. It's even resistant to extreme temperatures and extra tough so it can survive a crash. It was unclear whether the Audi Smart Display tablet will be sold with new Audi vehicles, sold separately, or not sold at all. In addition to introducing the new Audi tablet, Audi's Head of Electric and Electronics Development Ricky Hudi spent the bulk of the press conference discussing five areas of technological innovation for the car maker: lighting, connectivity, infotainment, piloted driving, and human machine interface. He said that "90 percent of all innovations in a car are related directly or indirectly to electronics." In lighting, he of course discussed the Laserlight headlights equipped on the Audi Sport Quattro Laserlight wheeled out during the car maker's pre-CES keynote presentation. The intelligent laser headlights will also be used in the new Audi R18 e-tron Quattro in 2014, he revealed. Next came connectivity. "With Audi connect, our models are the perfect mobile device for our customers," Hudi said. Audi connect allows drivers to use navigation with Google Earth, see traffic information updated every three minutes, access traffic light information, and more using only the car's own interface. They've also added wireless charging to the signature Audi phone box located in the center console. And Audi cars will soon come equipped with AT&T LTE service through Qualcomm parts, as the company revealed during its keynote last night. In the area of infotainment, Hudi announced that the second-gen Mobile Infotainment Platform 2 with a quad-core Tegra 30 processor, which goes into production this year in the new Audi TT. He also revealed the next generation of Audi MultiMedia Interface (MMI), which he called "the world's best control concept." It now features Google point-of-interest voice search, plus multi-touch gesture controls on the surface of the interface's large, central dial. It seems many of these features will be available in the new Audi "virtual cockpit," which will debut in 2014 in the new Audi TT. Finally Hudi addressed piloted driving, emphasizing that the tech required has been downsized from an entire trunk's worth of hardware to about the size of a small notebook. But in response to an audience question Hudi and Audi Chief Technical Officer Professor Ulrich Hackenberg (who also serves as head of global engineering for Volkswagen) revealed that for now passengers in piloted driving cars will need to sit in the driver's seat so they can be ready to take over if needed. Piloted driving in which passengers sit in the back seat like they're being chauffeured - which was shown off in a video at last night's keynote - is far in the future. Hackenberg revealed that Audi delivered 1.5 million cars in 2013. He also divulged that Audi will have 60 vehicles (up from 49 in 2013) and invest 22 billion euros in development by 2020. Audi of America President Scott Keogh also discussed making sure the company's technological advances are things that customers actually want. But he said Audi cars used 262 terabytes of data in 2013 in the US, up significantly over previous years, indicating drivers are definitely taking advantage of Audi connect features. "Without a doubt Audi has a goal here in the states to really remain the leader of progressive automotive technology," Keogh said. "We see this as clearly moving from a science project to the realm of customer readiness." He emphasized that Audi's new vehicles embrace technology without any compromises to the car itself. "We're always asking ourselves, 'Does the customer care?' and maybe more importantly, 'Will the customer pay for the technology?" he said. Driving and performance is still the number one priority for the car maker, but number two is now Audi connect. He also revealed that Audi's smart matrix headlights, which detect when another vehicle enters their beam and turn off partially to avoid blinding other drivers, are not yet heading to the US because of "outdated" Federal regulations. But he said Audi is working on finding a solution with the government.